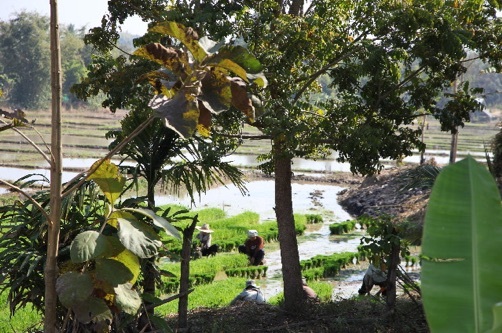 Irrigation plays a central role in agricultural production. According to FAO, irrigated agriculture provides 40% of available food including 60% of the cereals produced in the world. Around 20% of cultivated land - 300 million ha - is irrigated. Agriculture is by far the most water consuming human activity. It uses about 70% of the water consumed in the world. Out of the 110,000 km3 water that are provided by rain on the land surface of the earth, approximately 2/3 evaporate before arriving in the sea. The rest - 40.000 km3 - is usable by humans. Only 10% of this total is actually used. It is in Asia that the proportion of renewable water used is the largest (20.5%). Source: FAO Aquastat 2006 quoted in Water for Food, Water for Life,International Water Management Institute (IWMI), 2007. When compared to the population, availability of water is unequal. It is higher in Latin America and lower in Asia (only 1/10th of the available water per person in Latin America). Estimates are that 80% of the water used by agriculture comes directly from rainwater found in soil humidity (usually designated as green water). The rest of the water used comes from rivers, water storage facilities, lakes and underground reserves (blue water). Irrigation development has been the main factor underpinning the impressive growth of world agricultural production over the last five decades. The Green Revolution, which radically changed world agriculture, is based on the irrigated cultivation of hybrid varieties benefitting from the application of large amounts of fertilisers and pesticides. In Asia, more than two-thirds of the increase of cereal production is linked to the development of irrigation. Until recently, this approach was the model promoted by governments and the international community. However, the model had uneven results in different regions, and the awareness of the extent of its negative social and environmental effects took many years to emerge. For example, the Indian Agricultural Atlas shows very clearly the high level of degradation of water quality in the most agriculturally productive States. Over 40 years the irrigated area has doubled, growing from 139 million ha in 1961 (10% of total cultivated area) to 277 million ha in 2003 (18% of total cultivated area). This increase was mostly financed by governments, development banks and aid agencies. During the 80s, irrigation benefitted from close to 30% of the agricultural loans made by the World Bank. In Mexico, 80% of public expenditure for agriculture between 1940 and 1990 was dedicated to the development of irrigation. In the case of China, Indonesia and Pakistan, half of public expenditure for agriculture went to irrigation development. In India, 30% of all public investments were for the establishment of irrigation schemes. The peak of investment in irrigation occurred at the end of the 70s but the amount was halved by the end of the 80s. Asia has 70% of the world’s irrigated land, of which half is located in China and India. By 2005 there were altogether around 40,000 pieces of hydro-agricultural infrastructure of more than 16 meters high in the world. The maintenance and management of irrigation infrastructure was highly subsidised by governments. 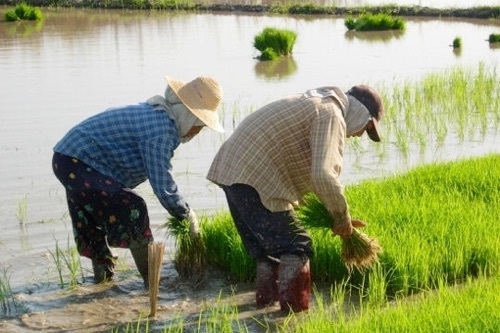 In the middle of the 80s, it is estimated that irrigation subsidies in six countries of Asia represented on average 90% of total maintenance and management costs. Some case studies showed that irrigation fees paid by producers represented on average less than 8% of the benefits drawn from irrigation. Despite the efforts made, it must be admitted that irrigation water is not managed efficiently. Now that awareness of the value and scarcity of water is on the increase, the strategy followed is changing, and rather than continuing to build new infrastructure, the thrust is now on how to increase the efficiency of what is already in place. This change is highly justified as estimates suggest that around 60% of irrigation water goes wasted. Moreover, pumping of underground water has led in many places to the overexploitation of aquifers and the progressive lowering of the water table. This is particularly true in China, Egypt, India, Mexico and in North Africa. Poor drainage in a large proportion of irrigated areas has also lead to waterlogging and salinisation. Around 25% of irrigated land in the South are thought to be subject to various degrees of salinisation. This will gradually make part of the existing irrigated area less productive or even unsuitable for cultivation. There are currently two additional types of investments besides the effort to improve the management of existing infrastructure. They are essentially: (i) mega-projects such as the projects of water transfer from the South to the North of China and the construction of inter-river links in India which seek to move water from surplus areas to regions where there is a water deficit; and (ii) small-scale collective or individual investments to establish small irrigation schemes and water pumping facilities. Because of its central role in increasing agricultural productivity and production, irrigation has been mentioned as one of the main causes for the decreasing trend in agricultural prices between 1960 and 2005. This decreasing trend has mainly benefitted poor consumers whose diet is based on cereals. Through irrigation, prices have become more stable insofar as irrigation has contributed to stabilise production. The increase in agricultural production and its processing has allowed the creation of new jobs. Those producers who have irrigated land have also seen their standard of living improved considerably. But they are often reduced to a minority, as in many countries irrigated land has largely been taken over by local rural elites to the detriment of the poorer sections of the population. Good data on the distribution of irrigated land is however quite difficult to find. •This proportion is less than 1% in Ghana. The development of irrigation upstream may also have negative consequences for the people living downstream, either by reducing the amount of water available to them for farming or fishing, or by degrading the quality of water. This has contributed to create tension between countries living in the same river basin (e.g. the Nile Basin, the Mekong Basin or the Niger Basin). Some countries are heavily dependent on water from rivers coming from others. Botswana, Bulgaria, Cambodia, Congo, Egypt, the Gambia, Hungary, Luxembourg, Mauritania, the Netherlands, Romania and Sudan get more than 75% of their water from a river coming from their upstream neighbours. The development of irrigation has also brought an increase in the occurrence of certain diseases (filariasis, diarrhoea, dysentery, typhoid, hepatitis, etc. ): it is estimated that in India in 1998, 44 million persons suffered from diseases linked to the establishment of irrigation infrastructure. There are also many examples of cases where people were expelled often without compensation to free space for reservoirs that would be created because of the construction of new dams. There is generally a close link between lack of access to water for production and consumption, and poverty. On the one hand, social inequalities are more important in irrigated areas than in dryland agriculture areas. On the other hand, it is the poorest regions in the world that face the greatest difficulties in capturing and using their water resources sustainably. There is some debate as to whether the choice to give priority to irrigation rather than to the development of dryland farming has been the best possible option. On the one hand, expanded irrigation certainly had extremely positive effects on the level and stability of agricultural production and on food prices. This effect was beneficial for consumers. One may however criticise the fact that a largely publicly funded irrigation was developed to the benefit of a minority of producers. One may also lament that the development of irrigation went hand in hand with the adoption of agricultural production technologies which have had a strongly negative impact on the environment. One may also question whether it would not have been possible to develop productive rainfed agriculture technologies that would have benefitted much larger number of producers with the volume of resources that was mobilised to develop irrigation. The development of irrigation was clearly a ‘‘hardware option to development’’ as it was conducted through huge building efforts using massive amounts of concrete and contributed to the development of a capital intensive chemical industry which also had disastrous consequences for the environment. 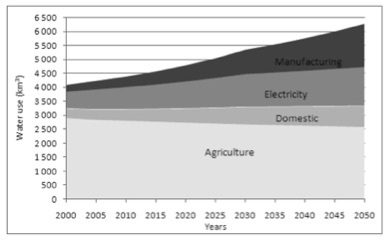 OECD projections show that the share of agriculture in the use of water is bound to decrease in the future because of a growing demand from industrial activities, power generation and domestic use (see diagram below). A considerable share of the water available, around 15% of the total, is also required to dispose of effluents (the so-called grey water). There will be a need to improve irrigation and water management techniques to try to avoid putting under further pressure a resource that is already being overexploited in many parts of the planet. Beyond this, the very structure of agricultural production will have to be modified to reduce the water content per kilogram of produce. •500 litres to produce one kg of potatoes. The water footprint of agriculture has been estimated to be caused 27% by cereals, 22% by meat and 7% by milk. It is now well established that producing animal proteins requires more water than producing vegetable proteins. 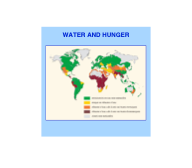 The rapid increase of demand for animal products resulting from the development of a large middle class in non-industrial and emerging countries is exerting a growing pressure on water resources, particularly for the production of animal feed. This makes some experts believe that the real reason behind the land grabbing movement observed in recent years is in fact the quest for water. This means that it will be indispensable to turn seriously to the development and improvement of dryland farming productivity. Currently, around 80 countries have a population facing water scarcity. In some of them, there are virtually no fresh water resources: Bahrein, Gaza, Jordan, Kuwait, Libya, Malta, Singapore and the United Arab Emirates. 450 million people are regularly facing water scarcity, and 2.4 billion people live without a basic sanitation system (UNESCO). These situations lead to strong inequalities. In many cases, vulnerable households have to pay for their water as much as ten times more than more favoured households. 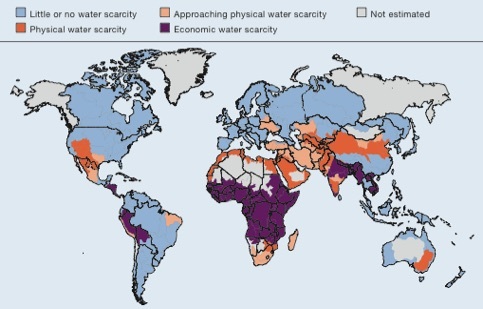 Water scarcity may arise from a lack of physical availability of water, or for economic reasons. 2.8 billion people live in river basins where there is insufficient available water (physical scarcity). Around 1.6 billion people live in areas where, although there is physical availability of water, clean water is not accessible locally for human, institutional or financial reasons (economic scarcity of water). It is expected that climate change will further contribute to the reduction of physical availability of water in the inter-tropical zone and to its increase in the temperate zone. In 2010, the right to water and sanitation was recognised as a human right by the UN General Assembly. Governments and international organisations are requested to provide financial resources, strengthen capacity and transfer technologies to poor countries to turn this right into reality. Will the recognition of the right to water and sanitation contribute to improve access to water by the poorer groups of population? What about the access to irrigation by poor producers and women? This remains a critical issue for the future and will have a determining role in the fight against hunger in rural areas. Besides the expected improvement of the efficiency of irrigation and perhaps easier access by poor producers, it is also possible to hope that with the importance that is now again given to agriculture and the awareness of water scarcity, at least a fraction of the resources allocated to irrigation development will be diverted to research on dryland agriculture. This reallocation of public resources would certainly have a remarkable impact on agricultural production and would immensely benefit the great majority of the rural population. -To manage sustainably our water resources, we need to change our food consumption, 2019.